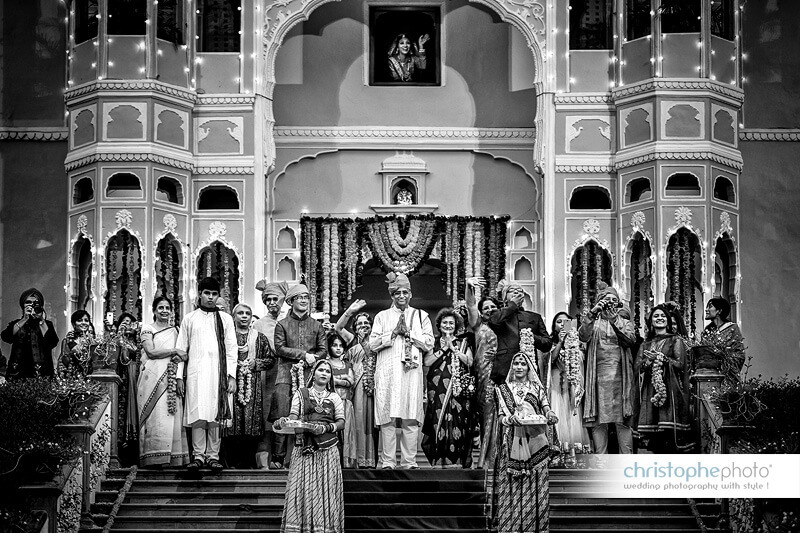 The very moment you think of Royal Indian weddings, visions of Rajasthan start moving about in your head. Within Rajasthan there are many cities like Udaipur, Jaisalmer and Jodhpur that fit the bill perfectly. However when you thrown in a few practical attributes like logistics and cost, Jaipur would pop up as the favourite. The city has many great venues where your dream of the regal wedding could be well fulfilled. We are sharing our pick of three exceptional venues for a royal heritage wedding in this three part series. ~ THE MYSTICAL INDIAN FANTASY. Since we have not yet mastered time travelling and visiting and experiencing the glorious past of Rajasthan is not really feasible, the closest that we can possibly reach is staying at the royal haveli of Jaipur’s former aristocracy, Samode Palace. As you trudge up the colossal structure, you might have a fleeting thought that perhaps there has been a fragment in the time space reality and you have been teleported a few hundred years back. Revel as you most certainly would when you walk across the walls that are a work of art, a narration of stories of time gone by, painted in spectrum of colours. Wander through its palatial courtyards and fountains and waterways or enjoy a cup of tea in its beautiful gardens while listening to the carol of birds. The property has magic sprinkled all over it! If you have grown up listening stories of prince charming arriving on a white horse (or an elephant, if you would like some improvisation) and always wanted to marry like royalty this is just the place. Located at an easy four hours drive from Delhi and an hour from the Jaipur, it is nestled among the Aravalis in the village of Samode. Away but not so away! It is a sweet distraction from the cacophony of city life. 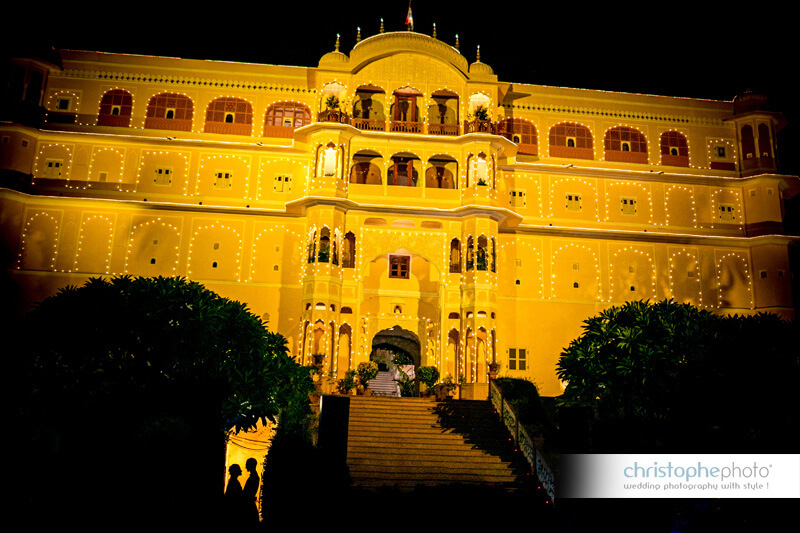 Samode Palace has 20 deluxe rooms, 19 deluxe suites and four royal suites. The rooms are a happy marriage of erstwhile opulence and modern luxury. The charming four poster beds canopied with sheer and contrasted with exquisite furnishings. Royal suites are sumptuous with its private courtyards and Jacuzzi with a spectacular view of Aravalis. 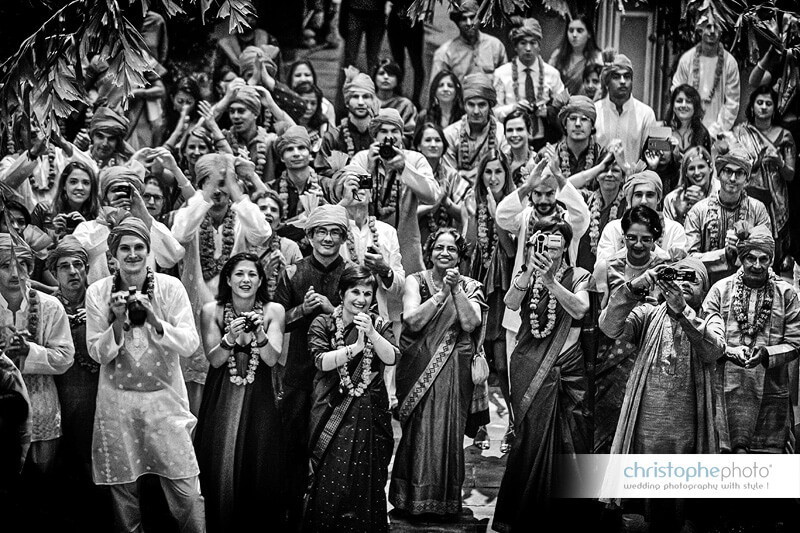 While doing a destination wedding, we understand you don’t want to go for routine banquet halls. But the halls of Samode are luscious and palatial to make you change your mind. The frescoed walls and imposing courtyards of Durbar hall reflect the quintessence of Rajput Mughal architecture. 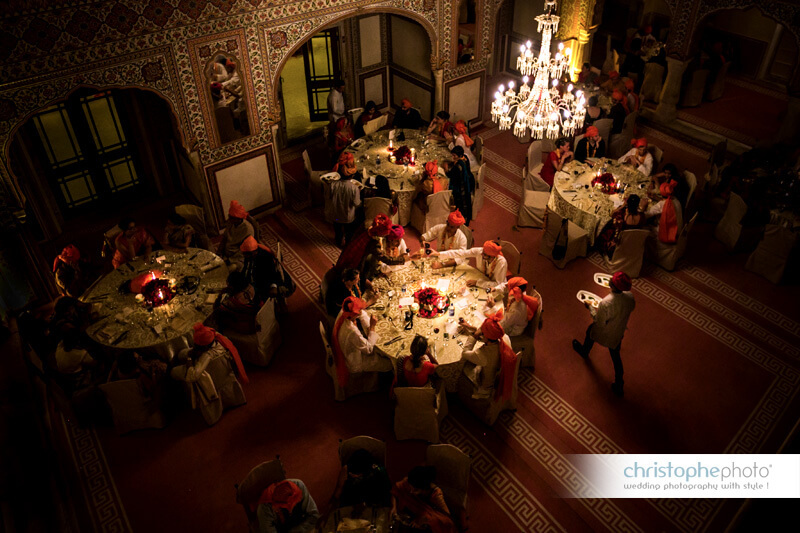 It can always be combined with the Durbar hall terrace which is overlooking the Aravallis, and can accommodate around 250 people. Then there is exquisite Sheesh Mahal, literally a palace of mirrors. The walls have been embellished with mirrors by the craftsmanship of jewellers who have created a masterpiece on the walls. It is a superbly cool and sensuous venue for the sangeet or cocktail ceremony. The main lawns are enchanting with fountains in the pathway and water channels flowing though, perfect for large gatherings of about 500 people. Their rooftop terrace is a romantic spot to host events surrounded by the mountains and the view of the fort. And the swimming pool deck is a great spot for intimate gatherings like high tea or pheras, with a beautiful lily pond which makes the setting rather alluring. We absolutely love their infinity pool at the terrace, in the lap of Aravalli, which is rather surreal and would be terrific for cocktails or other intimate ceremony. The bagh are a sublime beauty. Literally idyllic, the bagh has a meditative essence to it. The bountiful trees and flowers and manicured Mughal style gardens with fountains and waterways, serenades your senses. The accommodation is one of the kinds. The luxuriously appointed tents are laid out like the royal tented encampment of the bygone era. Located at a few minutes away from the Samode Palace, Bagh would be a wonderful venue to host your lavishly charming wedding. 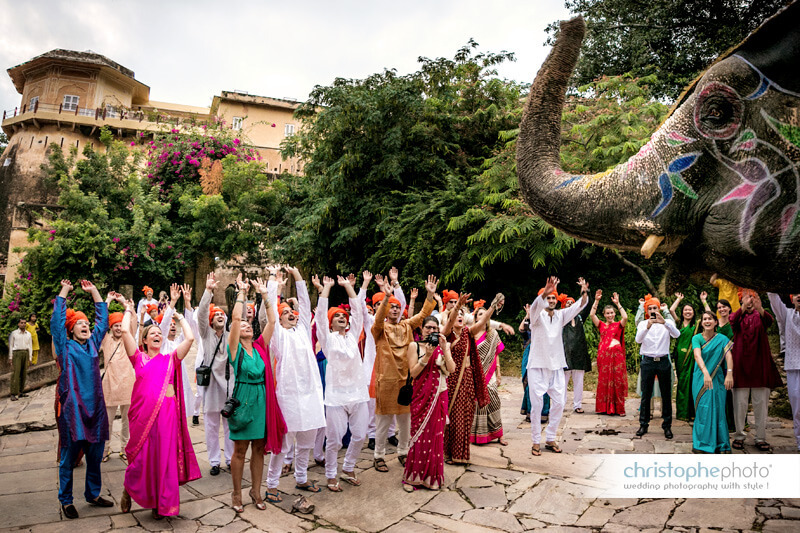 We like the idea of organizing wedding ceremonies at both Palace and Bagh so that you could have the best of both worlds. PS. 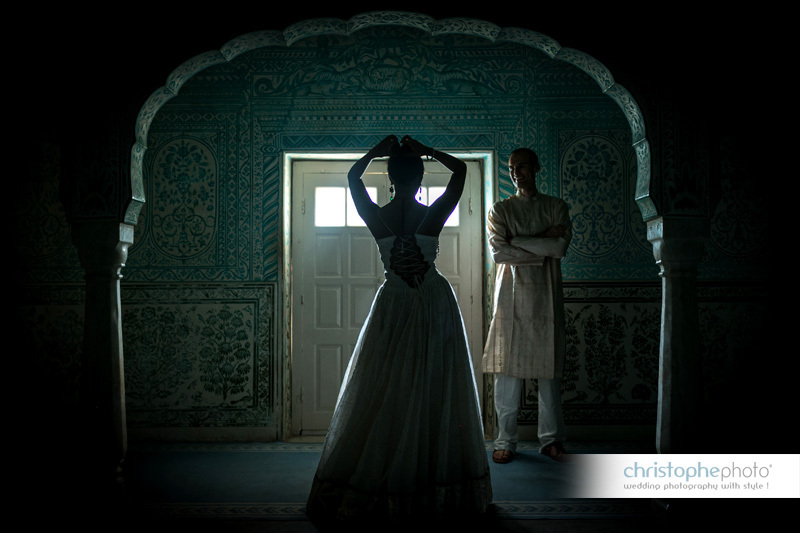 All Images (they are more than images) are courtesy of one of our favorite photographer Christophe Visuex. We know we have got some royal fantasies floating about 😉 stay tuned for the other two gem of wedding hotels of Jaipur.